Yesterday started off with one of my go-to breakfasts. 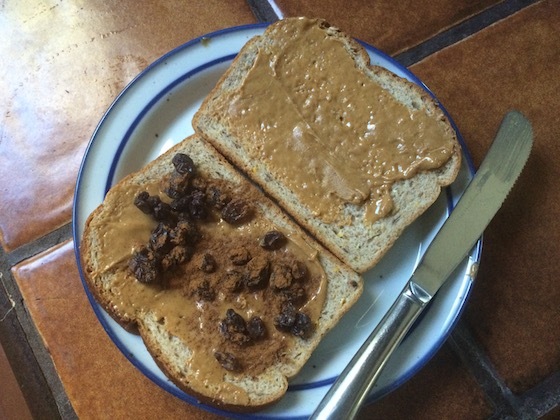 A fast sandwich: two slices of whole wheat bread, peanut butter, raisins, and cinnamon. It’s quick to make, yummy, and super filling. Raisins are great when you don’t have much fresh fruit around, especially because they last in the cupboard. Just remember – they’re more dense then you might expect, so a serving is just a couple of tablespoons, rather than the cup of grapes you might eat at one sitting. As long as you keep the portion size in check, they’re a great source of quick energy, fiber, and that hint of sweetness I always crave in the morning. 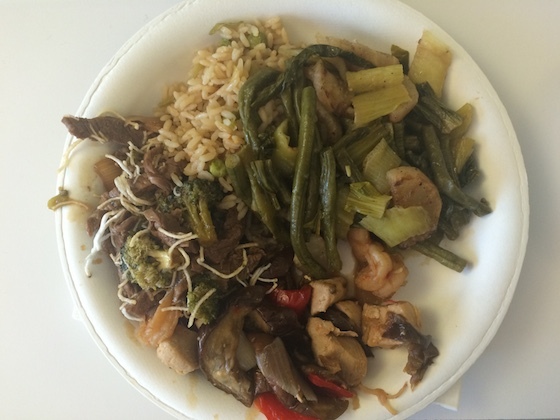 Lunch at work was Chinese food – not very photogenic, but it sure was yummy. I had stir-fry with beef, chicken and shrimp, a little rice, and plenty of veggies. It felt a bit lighter than typical Chinese, and it’s so nice that they offer totally different options each day. This keeps lunch interesting, and takes the pressure off preparing a complicated dinner every night. Although lunch was yummy, my tummy felt unsettled the rest of the afternoon. It may have been too many different flavors in one plate – I’ll have to keep an eye on that. I’m trying to get better at really listening to how my body responds to different types of foods, so I know what works for me and what to avoid next time. 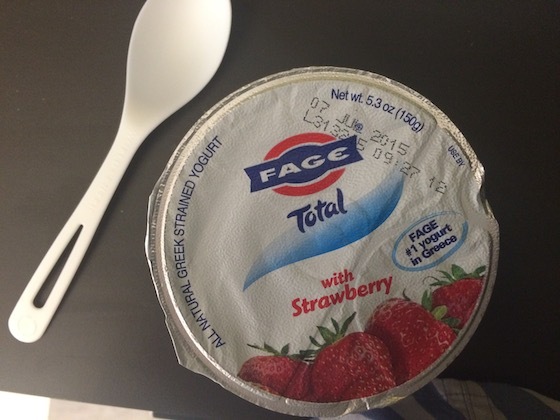 I felt quite hungry around 3, so I grabbed this yogurt; it actually helped settle my stomach a bit. I got home by 7 – plenty of time to enjoy dinner before The Bachelorette began! I was craving this meal after seeing something similar on another blog, so I made sure to pick up all of the ingredients at Trader Joe’s. I warmed two corn tortillas in a pan, then melted cheese over top. On that I put scrambled eggs and some salsa. On the side were cherry tomatoes and half an avocado. 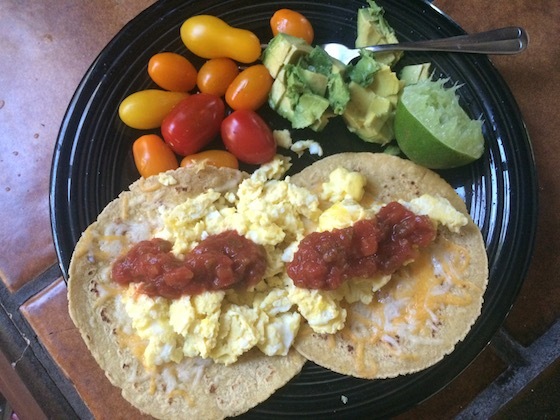 An easy and tasty take on breakfast tacos, which I’ll definitely be repeating on the regular!